Blazin’ Buttz BBQ is a competition cooking team from Long Island, NY. The team was founded by two co-workers who came together to cook a local barbeque competition in 2007 and now compete around the country every year. The team is run by Pitmasters Bob Schwarz and Frank Sacco, and Team Leader Laura Schwarz. Blazin' Buttz BBQ was honored to be named 2015 Kansas City BBQ Society (KCBS) 21st national Team of the Year in Pork. 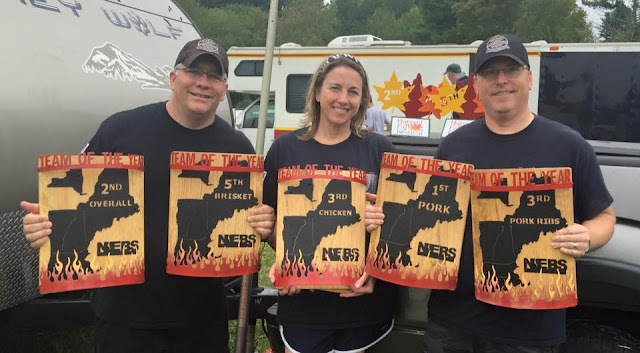 The team was also ranked Northeast BBQ Society (NEBS) 2nd Team of the Year Overall in 2015, and 1st Team of the Year in Pork, 3rd in Chicken, 3rd in Ribs, and 5th in Brisket. In 2016, the team earned 1st NEBS Team of the Year in Pork, 3rd in Brisket, and 4th Overall. They have also won 8 BBQ Grand Championships in the past few years and 8 Grilling Grand Championships. Blazin' Buttz BBQ has also cooked to support the following charitable organizations: the National Kidney Foundation, Make-A-Wish Foundation, Veterans Hospital in Northport, NY, Babylon Breast Cancer Coalition, Operation BBQ Relief, Suffolk County Police Athletic League, the USO and more.